After migrating your Exchange server (I’ve seen this in transition to exchange 2007 and 2010) the PublicFolderDatabase for your OfflineAddressBook is still pointing to the old servers public folder store. At Server you see the new servername and the PublicFolderDatabase is still pointing to your old server. Public folder replica’s and offline address book generation server are already moved to the new server. Solution: I found if you do the following steps you can change the PublicFolderDatabase. Look for the siteFolderServer attribute, here you will see the old public folder store. Choose clear and close with ok, now you may close adsiedit. 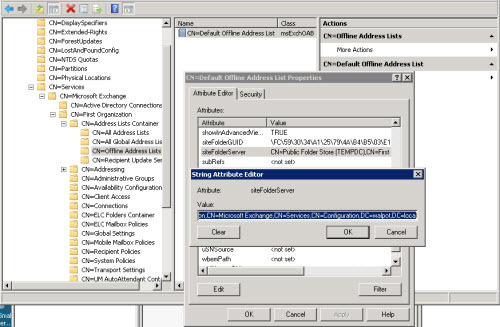 Now go to the exchange management console, Organization Configuration, Mailbox, Offline Address Book open the properties of the Default Offline Address List and go to the tab distribution. 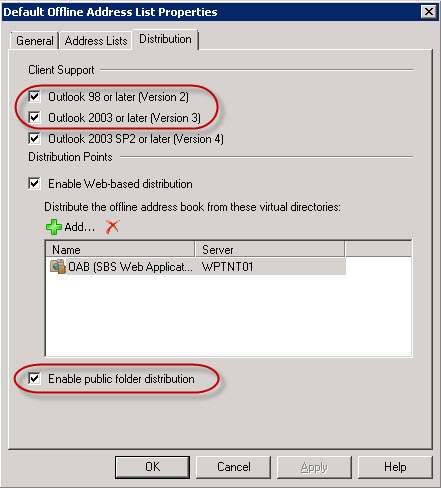 Uncheck “Outlook version 2 and 3″ at client support and uncheck “Enable public folder distribution”. Make sure “Web-based distribution” is enabled. Choose apply and ok, then right click on Default Offline Address List and choose update. After that go back to properties and distribution and check “Outlook client support version 2 and 3″ and “Enable public folder distibution”. Again choose apply and ok and right click and choose update. When you go back to the exchange management shell and repeat get-OfflineAddressBook | fl you now will see the public folder store on your new server. Below are the Exchange related sessions from TechEd North America 2011. Microsoft Exchange Online in Microsoft Office 365: Simple Migration Live! We get error when we try to move mailboxes from exchange 2007 to exchange 2010. These mailboxes have been started with new-moverequest with -SuspendWhenReadyToComplete option. When we resume moverequest to migrate the last 5% of the mailbox we get at failed mailboxmove with an errormessage: ”Unable to delete folder”. You can try to remove your current moverequest and make a new moverequest. This time move your mailbox in one hole pieace without -SuspendWhenReadyToComplete option. If you think moving mailboxes to Exchange 2010 SP1 is slow and taking longer time than in RTM version, here’s why! In RTM Exchange it was doing 5 parallel moves at a time, but in SP1 Microsoft changed MaxActiveMovesPerTargetMDB from 5 to 2 concurrent moves. MaxActiveMovesPerSourceMDB: This property indicates the number of mailboxes that can be moved on the source mailbox database at one time. The default value is 5 concurrent moves. MaxActiveMovesPerTargetMDB: This property indicates the number of mailbox moves that can be moved on the target mailbox database at one time. The default value is 5 concurrent moves. MaxActiveMovesPerTargetMDB: This property indicates the number of mailbox moves that can be moved on the target mailbox database at one time. The default value is 2 concurrent moves. The change in MaxActiveMovesPerTargetMDB in SP1 means that we can only do 2 concurrent connections. you can change MaxActiveMovesPerTargetMDB back to 5 to allow 5 concurrent moves. Save the file, and restart the Microsoft Exchange Mailbox Replication service and do this configuration change on all your CAS servers. Review the other settings to make sure they reflect what you’d like to see in your environment, and to ensure you’re not getting throttled on any other setting that may pertain to what you’re trying to accomplish.